Tom Paris (Robert Duncan McNeil) and Capt. Kathryn Janeway (Kate Mulgrew) suffered the consequences of travel at Warp 10 in the "Star Trek: Voyager" episode "Threshold." In the "Star Trek" universe, the fantastic speed of warp 10 has remained annoyingly out of reach. However, a recent paper in an open-access journal describes an experiment that attempted to break that boundary. The fact that the "experiment" described in the paper wasn't conducted in a real-world laboratory, but in an episode of the sci-fi TV series "Star Trek: Voyager," reveals just how easy it is to publish fake science in some so-called "predatory journals." The paper's author, a biologist for 30 years and a fan of "Star Trek," wrote up a research paper based on the "Voyager" episode. He submitted it to 10 open-access journals known or suspected of charging authors publication fees without providing the editorial services associated with legitimate journals, such as careful peer review and vetting of the paper's claims. Four accepted it, though only one, the American Research Journal of Biosciences, published the paper. These so-called predatory journals have low or non-existent scientific standards and a willingness to print any papers submitted. "Predatory journals aim only to make money from researchers," Jeffrey Beall, a research librarian at the University of Colorado, Denver, told Space.com by email. Beall has long worked to expose predatory journals. At one point, he maintained an online list of them, though ongoing harassment against Beall, his employer and his colleagues resulted in him taking it down last year. The list has been reposted at various sites on the web. BioTrekkie said he was motivated by a similar "Star Wars" experiment, in which a paper on the fictional midichlorians behind the Force was published by an open-access journal. That paper was a sting operation by the so-called Neuroskeptic, who blogs pseudonymously for Discover Magazine. According to Neuroskeptic, the purpose was to expose predatory journals that claim to offer peer-reviewed open-access publications but will publish anything for a fee. "Midichlorians are sometimes criticized as one of the most ridiculous elements of the 'Star Wars' universe, so I thought I needed to even things out by picking what is arguably one of the scientifically worst episodes of 'Star Trek,'" BioTrekkie told Space.com by email. "I was also curious what sort of responses I might get by the subset that reviewed the paper," he said. The paper describes the plot of the episode as research. The paper uses the word "celerity," which means extreme speed, in its title, but further down BioTrekkie parenthetically describes the theoretical maximum celerity as "warp 10." Despite this and other fictions, including those involving the author and affiliation, the paper was published as legitimate research. "Many of the predatory publishers are based in Asia or Africa and their owners may be unfamiliar with the 'Star Trek' characters," Beall said, when asked how editors could have overlooked such obvious jargon. 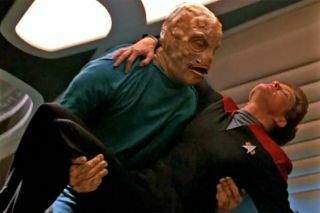 Because the characters were returned to their human forms by the end of the episode, BioTrekkie suggested that the sudden mutations wouldn't necessarily stop the crew from breaking warp 10 in the future. "Seemingly everything in our future can be fixed with a damper or compensator," BioTrekkie told Space.com. These fixes are common in the "Star Trek" universe. The paper calls for future studies on the impact of warp 10 on human genetics and physical changes. Speaking as though the experiment were fact instead of fiction, BioTrekkie said, "Given we now know what to expect, we can impose the intense antiproton burst regiment treatment early— we can build it into the shuttle as a metamorphosis compensator." Warp 10 has surprising and devastating morphological consequences in "Star Trek: Voyager." "Very little direct science substance"
Academic journal subscriptions can be costly, which keeps their research out of reach for some scientists and the public. In recent years, publishers have founded open-access journals that allow anyone to read their publications, no cost required. These journals make their money by charging author fees to those whose papers have been submitted for publication. But some journals can take this too far. So-called predatory journals focus more on the fees and less on the scientific accuracy. Predatory journals "are not selective in what they publish," Beall said. "They are essentially counterfeit journals, mimicking the look and feel of legitimate online journals, but with the singular goal of making easy money." BioTrekkie's "research" isn't the first to target predatory journals. The enormous amount of spam that researchers receive by email may have prompted the submission of one paper that repeats its title phrase, "Get Me Off Your F---ing Mailing List," for 10 pages straight, as reported by Vox. Inspired by recent stings, and motivated to get "Star Trek" published alongside the earlier "Star Wars" "research," BioTrekkie published his new paper, which listed six "Star Trek: Voyager" crewmembers as authors. All six were affiliated with the Department of Biomedical Engineering at Starfleet Academy. The contact was given as a Gmail address. Of the 10 open-access journals he selected, only one noted that Starfleet Academy appeared to be a fictional affiliation. No one noticed the "Star Trek" references, despite the fact that the research used the recognizable phrase "'warp 10." Five journals did not respond to the paper. "That's a high rate, so I'm thinking at least some of them figured it was a fake," BioTrekkie said. Four others accepted the paper pending some minor revisions. The fifth remaining journal, which had identified the fictional affiliation, rejected the paper because it had already been published online in the American Research Journal of Biosciences. Peer review is a staple of academic research, with scientists not involved in the research reviewing the methods and asking for clarifications. The process helps to ensure experiments are repeatable when possible, along with evaluating whether the results support the author's interpretation. The peer review provided by the two journals was not up to par. "There was very little direct scientific substance," BioTrekkie said. "The reviews were of the kind I might expect from someone with some basic undergraduate background in biology or statistics." According to BioTrekkie, reputable open-access journals nearly always charge a hefty publication fee, which they will occasionally waive for authors without funding. Non-open-access journals sometimes have very low or no fees, especially if the author is a member of the society publishing the journal. While reputable journals exist to exchange scientific information, predatory journals focus on profits. "For that reason, most predatory journals are open-access, so they can make money," he said. All four journals that accepted that paper had hefty publication fees initially, he said. Only one agreed to waive the fee completely when he said he had no dedicated grant funds, but that one went silent after the paper was submitted. Others were willing to drop the fee, though not completely. "The one in which I ultimately published the paper — which was also one of the ones that did provide a peer review—did so for $50, when the original invoice was $749," he said. He paid that money out-of-pocket. Because he was paying the fees himself, he opted not to publish the paper in the other three journals. So why would a journal whose only goal was to make money lower its fee? "For marketing purposes, predatory journals often waive fees or offer discounts to attract article submissions, especially when they are first starting out," Beall said. The goal is to fill up their journal with published articles, giving it an appearance of legitimacy. "Empty journals are suspicious, but journals full of papers look like successful journals to some," Beall said. The ten journals BioTrekkie submitted the new research to seem to be following that strategy successfully. The author said a quick look at just a couple of the papers revealed the journals' willingness to publish whatever they were sent. In most cases, other published papers were "insubstantive, poorly described, poorly supported," he said. On the other hand, some of the papers seemed legitimate, leading him to wonder if the authors knew they were submitting to sketchy journals. It's possible that some researchers considered that submitting to such a journal was better than remaining unpublished. "Despite working in my science field for decades, no one else I know personally has intentionally sent their works to one of their journals — it would reflect quite poorly on their résumé, I think — even as a last resort, so I think that's quite rare," BioTrekkie said.